I finally found myself some time to pen down my thoughts for 7th May 2011. GE2011 is not quite the same for me as compared to GE2006 which I was a part of it too. In GE2006, I was both the Polling and Counting Agent for Aljunied GRC. In GE2011, I was a candidate and of course still rooting for all the constituencies the Workers' Party had contested in which also includes Aljunied GRC. The day continued with activities such as buying meals and delivering it to the respective Polling Stations for all Polling Agents. When dinner was finally distributed, my team of 4 and I stopped by for a drink and this was when I was reminded that polling will end soon and that means counting will take place after that. The first thing that came into my mind was, the months of walking and the intensive 9 days of campaigning would soon be reflected in the result slip that I was going to get that night. In the case of East Coast, Nee Soon, Aljunied and Hougang, it was the years of walking and door knocking that we had done. I quickly finished my ice Milo before making my way to the 1st counting centre, Rivervale Pri Sch. Atmosphere was pretty tense as I entered the counting hall. The respective counting agents were waiting for the ballot boxes from the other Polling Stations to arrive. I didn't see the other 2 candidates. I supposed they went to the other counting centre first. I've got very committed counting agents who assured me that they would fight for every vote! Hahaha! As the counting commenced, I was making my way around the 5 counting tables, spending a good 7-10 mins of time witnessing the sorting and counting for every table. Judging from what I saw, every 4 in 10 ballot paper, I can see a cross for the Workers' Party. With that, I made my way to the other counting centre, where the counting of both 'Punggol East' and 'Pasir Ris-Punggol' were held in the same hall. As I arrived, Mr Michael Palmer was about to leave. We wished each other luck and we moved on to what we needed to do. I went through the same routine in the 2nd counting centre. About an hour into the counting, it looks like a 38-40% of the eligible votes for the Workers' Party. The candidates of the Workers' Party were all fighting to win but we were also prepared for the worse. I remembered receiving an email to inform all candidates to get ready 2 speeches on Polling Day, winning and losing speech. To be honest, I did not prepare for any. I wanted to just speak whatever that came to my mind that moment hence I started to think of what to say as we made our way to the assembly centre. Oh yes, it was a losing speech. My family was there. Before I could even say anything, my father came up to me and said, 'Regardless of the result, you have done your best and we are all proud of you.' I was so moved by those words. Ever since it was made known to me that I will be the candidate for Punggol East, I spent almost all my time covering the ground. I didn't have much time with my family during that period. Is time to spend some quality time with them. Rumours of Workers' Party winning both Hougang SMC and Aljunied GRC were spreading like wild fire in the assembly centre. I was quite skeptical about it. It is better to hear from the horses' mouth, I thought. Bernard and I were talking about it just a few hours before results were announced. We both thought that let's hope that we can retain Hougang, home ground, first! When Shin Leong arrived, I need not asked him, the result was written all over his face :) He brushed aside the rumours that a recount took place in Hougang. No recount was done. This to me means that we won by a good margin. Grrrreatttt! Next, the Aljunied team came in. The team came forward, grinning from ear to ear. I had to ask. Sylvia, who was right in front of me, was looking so so so elated. I knew it. Emotions started to fill me up, as I was controlling tears from flowing down, Mr Low TK came up to me. I remembered his question. 'I think I did reasonably well for a first time candidate, probably about 38-40%', was my reply. Mr Low nodded his head, gave me a pat on the back, before moving on to the next candidate to perhaps also asked how his/ her results were. We know all that is history now. The real work starts from the day we won. We have to show that the Workers' Party can manage a GRC as well as a SMC. I have been appointed as the Legislative Assistant for newly elected MP, Mr Pritam Singh. This to me is another new chapter of learning as a political activist with the Workers' Party. I certainly hope that my experience as a candidate can propel me to greater things. And I sincerely hope that 5 years later, the electoral boundaries for Punggol East will be what it is today. With that, I hope to be able to walk the ground of Punggol East again. A place which I have come to love and know the residents as well as store holders. Towards a First World Parliament! Welcome and Thank you for coming to our rally, my friends and fellow Singaporeans. Thank you for coming down to Serangoon Stadium this evening. Today, I am going to speak to all of you here directly from the bottom of my heart. Fellow Singaporeans – we have come to the tail end of a long journey, a journey which started not 9 days but 1,460 days ago on 6 May 2006. Your voice and your eagerness to hear what we have to say have brought us thus far. Your vote for the Workers’ Party this coming May the 7th will set Singapore on her next lap, a lap where the baton is passed from one Singaporean to another. In a contest as long and difficult as this campaign has been, the spirit, perseverance and the determination of every Workers’ Party member commands my respect. In the eyes of every Workers’ Party member, I see courage and a consuming determination to bring about the breakthrough that Singapore needs. From Uncle Ee Ping, the veteran and long-time stalwart of the Workers’ Party to Bernard Chen, my most faithful election agent, who has selflessly walked with me on this long journey, I salute each and everyone of you. Thank you. Thank you. The Workers’ Party and Singapore is stronger today because of these individuals and their efforts. I thank all of you for contributing to the nation-building efforts of this young and beautiful nation which you and I call home. In the eyes of every volunteer, I see nothing but pride, pride to recognise themselves as a true blue Singaporean, where the meaning of the pledge resonates in their hearts, where the spirit of our anthem is played continuously as they take every step with me. Majulah Singapura! Majulah Singapura! I owe my campaign to many people. People whom I did not even know 2 months ago like Marcus, Simon, Binson, Leandra, Sandeep, Azam, my uncle, my family and my husband, are now my closest team mates in this campaign (forgive me if I have forgotten any one). They have stood by me, shared my laughter (my short temper? sometimes) and my worries. They motivated me and reminded me constantly of the responsibilities that I have to shoulder as a candidate. In you, I see courage, courage to stand with the Workers’ Party, and courage to hold our flag high. Two words. Two words continue to be proclaimed through the evening sky. Two words which have given my colleagues and me so much encouragement and strength. Two words which have brought you from the four corners of this island to stadium after stadium, open field after open field. Be it wet or dry, you came. Today, as we gather in Serangoon Stadium once again, these two words will continue way into this Thursday night and into Cooling Off Day. These two words are “Workers’ Party”! Throughout the campaign we have tried to convince you that elections matter, that we are a credible party with credible alternatives to a PAP that only knows how to threaten you and apologise at the last minute. We stand before you, proud to be a Singaporean, proud to represent you, proud to be of service to you, proud to stand with you, and proud to call you my fellow brothers and sisters. This is a watershed election and I am proud to be a small part of it. Come 7 May 2011, I hope that Singapore will make its first step towards a First World Parliament. And we can do this, if you vote for us. Vote Workers’ Party. Tonight, when you depart from this stadium, remember that we have come a long way since 1965. As a young Singaporean I supported the PAP, I believed that they were the best thing for our society but I stand before you as a 33-year old woman who has had enough of them. They don’t care about rising costs, they give themselves big fat salaries, they have lost the moral integrity needed in any leader. They have become our managers, our bosses, here to tell us what to do, how to think, but they have forgotten how to lead. Why do I say this? Because they no longer know how to listen to the people, to ordinary people like you and me. They listen to each other but you have heard our leader, Mr Low, tell you how lonely it is to be an opposition in a Parliament where there are 82 of them and 2 of us. You hold the future of our nation in your hands. I trust you, fellow Singaporeans, and I know you will do the right thing by your opposition. This election is more than just upgrading, upgrading and more upgrading! It is a vote to bring into focus again the real needs of ordinary Singaporeans. We bring you a whole range of talent – From business expertise to social work know-how to teachers in both secondary school and tertiary sector, we bring many skills. And we bring you the heart that is sorely missing in the PAP until the last minute or until it is election time. 1. What plans do they have for our HDB flats since PAP keeps telling us that “the PAP had enhanced our assets”. We don’t want to work our whole life just to pay for our flats. 2. What concrete plans do they have for our youth who have to borrow from the bank for their tertiary studies? 3. What is the point in asking retailers to hold their prices while ministers’ salaries are increased? 4. What plans are there to help people who are in the 50s, unemployed and who cannot draw their CPF to pay for their medical bills? If you think it’s time the PAP gave you some straight answers, give us a chance on Saturday, vote for us and let us show you what we can do. My name is Lee Li Lian, the Workers’ Party candidate for Punggol East SMC. On 7 May 2011, vote for me, Vote Workers’ Party, Towards a First World Parliament. My 3rd speech at Punggol East SMC! Dear voters of Punggol East SMC and fellow Singaporeans, welcome once again to the WP rally! I am Lee Li Lian, the WP candidate for Punggol East. Thank you for coming. Dear voters, da ka hao! Happy to have the opportunity to meet everyone here. We know you have taken precious time to be here to attend the WP rally. On behalf of WP, we thank you for coming. During my walkabouts since the birth of Punggol East SMC just over slightly less than 2 months ago, I have been asked by residents, young and old alike what I will do if I am elected. I have no million and multi-million projects to announce today, neither am I going to make you empty and false promises. I see myself as a down-to-earth person and if I am elected, the immediate and most important thing is to establish a town council from scratch, to serve Punggol East residents and to take good care of the constituency, a most privileged role, if entrusted to me by the residents of Punggol East. Setting up a Punggol East Town Council with the experience I have gained from working alongside Mr. Low Thia Khiang and members of the Workers’ Party in Hougang is my top priority! Nothing would be more important than this. 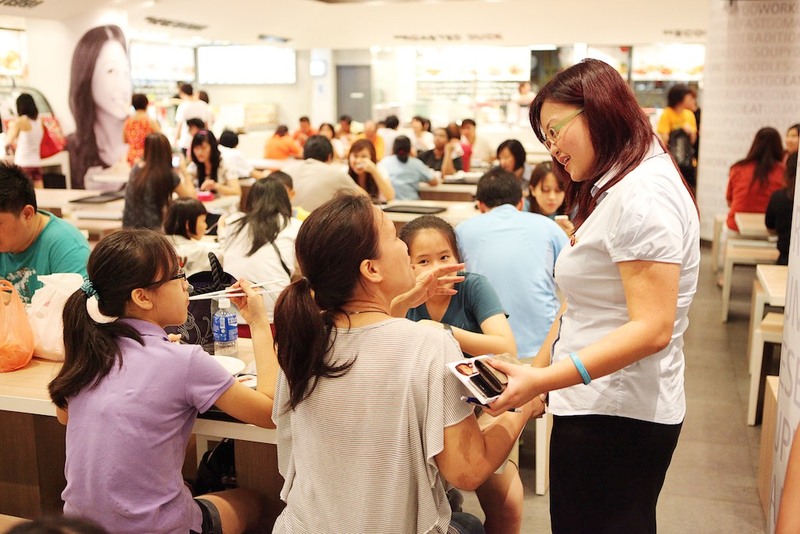 I will be a good Member of Parliament and serve the needs of every Punggol East resident. What do I mean by that? • First, I am keen to make representation on behalf of my residents at the Meet-the-People’s Session. • Second, I will look into the issues that concern Punggol East residents and raise them on a national platform. I will listen to you and speak up on your behalf in Parliament, to let the Prime Minister and his cabinet know that your interests must be taken seriously in the policy-making process. • Third, it is my duty to make sure that the constituency is well-managed and well-taken care of. I want the best for my residents, the residents of Punggol East. Nothing but the best, to the best of my abilities. To the PAP, your talk of community bonding and spirit is hollow and hypocritical! How do you build a strong community when after every General elections you break up the boundaries at the slightest hint of competition from the Opposition? Why chop part of Aljunied into Ang Mo Kio? A friend of mine who has been staying in Hougang for the past 20 years voted in 3 different GRCs, Cheng San GRC in 1997, Aljunied GRC in 2006 and now Ang Mo Kio GRC without having his house move an inch! And I’m sure everyone here knows at least one other person who has had this experience. Is this community building or community breaking? In my last speech I spoke about 2 silent groups in our community, - the elderly and the disabled. Today, I will briefly touch on another 2 groups. Many Singaporeans keep bringing this up but nothing gets done! Work fare bonus is only meant for people with an income. As an inclusive society, have we forgotten stay at home parents who do not earn an income? These stay at home parents or home makers (in other developed countries they are called ‘carers’ ) have chosen to stay at home to take care of the house and family so that other members of the family can go out to work or attend school, and have piping hot meals served to them when they come home. They are the CEO of the HOUSE but they are given none or very little recognition for their valuable contribution to home and society. They have chosen a noble profession that is no less important than any salaried job, and have often put their careers on hold to nurture the next generation. They should not be forgotten! The Workers’ Party proposes that Stay at home parents should receive the same infant care and childcare subsidies as other working mothers! Our inclusive society has also forgotten the 2nd group, single parents, who are Singapore citizens and whose daughter and son will bear and nurture future generations as well as serve National Service. Did you know that single parents are not allowed to purchase new HDB flats? The only option available to them right now is to wait till they are age 35 and above to buy a resale flat which is often very expensive! But to Mr Mah Bow Tan it is affordable! I believe the government can provide more housing options for them such as 2-room or 3-room flats. Regardless of marital status, all parents love and want to provide their children with the best they possibly can. Some single parents need caregivers too, but they are excluded from tax relief, caregiver relief and maid-levy relief. Babies from single parents are also not eligible for Baby Bonus. While having children outside of marriage should continue to be discouraged in our society, children born to single parents should not be denied the benefits that children of married parents receive. The children are innocent parties and should not start life being disadvantaged. Single parents should receive the same parenthood benefits packages as married parents. Allow me to quote our pledge, ‘happiness, prosperity and progress for our nation’. How can there be actual progress when stay at home parents and single parents are being left behind! We, the citizens of Singapore should move together as one people under one Flag! I am glad that he is aware of the idea of balancing. But it is not so much just balancing residents’ needs, it is about re calibrating the residents’ voices. Currently, the Parliament is made up of 82 PAP MPs vs 2 Opposition MPs. Mr Michael Palmer, you are in fact adding onto the great imbalance in Parliament! That is why there is an urgent need to vote more Workers’ Party candidates into Parliament. Mr Michael Palmer from the PAP is like me a first time contestant for this electorate. We have an equal chance to prove ourselves. But as an opposition candidate, we only learnt about this new SMC at the end of February this year, it leaves us with very little time to walk the ground! Do you, voters of Singapore, think that this is fair to the Opposition? My call to you today is, let us recreate history once again just like what we did 30 years ago! This watershed election could be the most significant election for the Workers’ Party! In 1981, the Workers’ Party won in a 3 corner fight. 30 years on today, the Workers’ Party with your votes can also emerge victorious and re-ignite Singaporeans’ confidence in a democratic process! On 7th May 2011, your ballot paper is not just a piece of paper with a cross on it. It is a piece of paper that will propel the Workers’ Party to electoral victories in Hougang, Sengkang West, Joo Chiat, Nee Soon, Moulmein Kallang, East Coast, Aljunied and PUNGGOL EAST SMC! Vote Workers’ Party. Towards a First World Parliament! Friends, fellow Singaporeans and dear residents of Nee Soon GRC, “ni men hao”!!! Thank you for coming down once again to support the WORKERS’ PARTY! Thank you very much! My name is Lee Lilian and I am the Workers’ Party candidate for Punggol East SMC. Today, I am here to talk to you two groups of people who have been forgotten in Singapore, I call them the silent community. The first group – the elderly. Our senior citizens worked hard, contributed to nation building and the growth of our country but when they are in their twilight years, they are forgotten. They are even engineered to travel at specific time of the day. Before 9am, their concessions don’t apply. Our senior citizens who wish to continue working finds it difficult to find a job. Our senior citizens who wish to retire are told that they have to work longer. Where do we leave them? In no man’s land? Our senior citizens who have been saving up since they were young now find that they do not have enough money in their CPF to retire. Singapore can do better than this! • Older workers must be protected from exploitation and financial hardships upon turning 62. The Workers’ Party also recognized that the current re-employment provisions are in place but these provisions should be re-worked to provide stronger protections for older workers. • The prices of new HDB flats should be pegged to the median incomes of Singaporeans households. Dear Mr. Mah Bow Tan, I am sure many Singaporeans here today would agree with me that the length of mortgage loan is indeed an issue. Mr. Mah, I am just curious here. Do you want your own child to take 30, 40 or 50 years to pay? Oh, I forgot. You won’t need such housing loan, unlike us. As for me, I believe that HDB flats should be affordable and my child should be able to pay off his loans in 20 years’ time. We belong to a society, a caring society. We call Singapore home, our home. But there is another group of silent community, the ones whose voices have been blocked out for so long, they are the disabled and they are forgotten. • The disabled who often travel on public transport finds it hard to do so. This is especially so when they travel by taxis to areas not covered by wheelchair accessible buses. Let me say this once again. Singapore can do better than this! People with disabilities have the right to live a dignified and fulfilling life and be integrated with the rest of the community. • The government should be more involved and bear the cost of purchasing Wheelchair Accessible Buses and bear the responsibility for modifying all bus stops to make them wheelchair accessible. • The government should also fund disabled transport concessions, in line with best practices in other developed countries. Since young, I have known Singapore to be my country and my home but today we hear that Singapore is run more like a company than a country. Nowadays it seems like Singapore is all about record GDPs and making more and more money. We, the people of Singapore and our welfare seems to have taken a back seat since we handed the ruling PAP a mandate of 66.6% at the last elections in 2006. In case the PAP do not know what this means, let me remind them again. For every 10 eligible voters, at least 6 voted for them. Yet, they have failed to take care of us, the people of Singapore. It is only when the elections are around the corner do we feel like we matter. • 20 March 2011, SBS Transit will start adding another 170 train trips per week during the morning and evening peaks, as well as off-peak hours, on the North-East Line (NEL). • On the same day, the retail price watch group roll out initiatives to ease the pressures of rising prices on the average Singaporean. Probably, we really should have General Elections every year. Only when the elections are here do we feel better taken care of. Apart from all these, Singaporeans get to see their PAP MPs almost every day. Elections are indeed amazing. Singapore is no doubt a country, My Country, Your Country, OUR COUNTRY. This election, we the people of Singapore are taking back our country! On 7th May 2011, we the people of Singapore are taking back our country. The Workers Party believe that it is a time for you to act, to cast your vote, to choose; there is no better time than now for a call to action. This is my call to you, to everyone of you here today. Help us turn the attendance today into votes for the Workers’ Party. On 7th May 2011, Vote Workers’ Party. Towards a First World Parliament! 6th day into our campaigning! My maiden speech, 'Political Insurance'. Good Evening everyone. I am Lee Li Lian, the WP candidate for Punggol East. In an article on Channel News Asia, in November 2008, PM Lee had said that a 2 party political model cannot work in Singapore. In the same article, PM also said: "If the party (PAP) doesn't work, if something goes wrong with the party, you can be sure new parties will come, new contests will come. People will spring up to take on the government in no time at all." If any party were to spring up from nowhere and starts governing; Singapore will be in great danger. We will be governed by people with no experience at all! No party, not even the PAP, is infallible and there is no guarantee that such a scenario will not happen. It is, therefore, important that we have some political insurance. What this means is that we need to ensure there are alternative parties in Parliament to participate and gain experience in the governing of our nation. We can then have another experienced party with ability to form an alternative government on standby in times of crisis or needs. We can’t plan our future in the future; we got to plan it now! Just like personal or health insurance, we may not think we need it or want to buy it now. But most of us buy it anyway for a peace of mind as we never know when we will need it. And when that happens we are protected and can be taken care of. Similarly, we need to insure Singapore and our future. I’m sure most of us here buy Insurance one way or another. We either buy it ourselves through an agent or we are all part of the government’s opt out insurance schemes such as DPS, Medishield and Eldershield. Some of us who own HDB flats are probably under compulsory insurance schemes such as HPS (HOUSING PROTECTION SCHEME) which protects our loved ones from losing their homes should something happen to us. The reason why we buy insurance is for investments as well as protection purposes. When we do investments we don’t put all our eggs into one basket no matter how strong and robust that basket is right now. Likewise when it comes to governing a country, we should not rely on only one political party. Voting the Workers’ Party is an insurance against failure. Should today’s government fail, there should be another party who is ready to take on the role immediately. And that party will need to have the mandate of the people to do so. check and balance on the government. This will keep the government on its toes to ensure accountability. All policies and issues will be debated thoroughly and alternative ideas considered seriously before implementation. If you can remember, in 2007 just months after GE2006, the PAP government announced that the GST would be increased from 5% to 7% from July . Inflation rose at the fastest pace in 12 years due to the hike in GST as food costs rose and rents soared. To make things worse, the bus fares increased about 1.8 per cent. My fellow Singaporeans, 66.6% of you voted for the PAP in 2006, and you got GST increase, record high inflation rates, higher food, transport, and healthcare costs. Do we want history to repeat itself? Do we want all these to happen again after the 2011 elections? We need to ensure that the government is transparent and accountable to the people but without an effective opposition in Parliament, the government can choose to ignore our concerns and brush aside our worries. The government encourages all Singaporeans to plan for the future, to ensure that we have enough funds to tide us through our retirement . The PAP government wants us to plan ahead hence they had implemented various insurance schemes. But when it comes to the need for political insurance, the government does NOT plan ahead. Regardless of how formidable the PAP might be, no one can guarantee that it will never fail in future. Because we understand that past performances is not indicative of future performances. We also know the story of the Titanic which was supposed to be unsinkable. It sank anyway on its maiden voyage killing more than 1,500 people. We need to have a backup. Fellow Singaporeans, what Singapore needs is a First World Parliament, a Parliament that leaves nothing to chance and is actively prepared for any unforeseen circumstances. It should be able to check and balance a strong government. In every GE, the WP strives to bring you a slate of good, credible candidates. Vote WP, towards a First World Parliament!